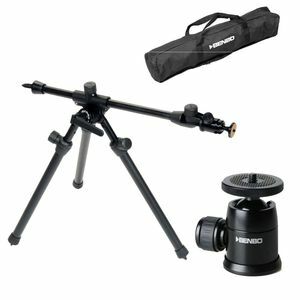 The Compact Trekker Tripod from Benbo is a lightweight verison of the Classic No1 tripod and is ideal for use where the tripod needs to be carried a greater distance. The newly designed leg head castings allow the legs to be folded compactly when transporting the tripod. Features tubular aluminium legs which offers the best combination of weight and rigidity possible. The flexibility of the leg joint mechanism combined with the ability to swing the centre column through 180 degrees, this allows the camera to be positioned at almost any point relative to the tripod legs. A hook at the bottom of the centre column allows a camera bag or sandbag to be attached when greater stability is required. This kit includes a ball and socket head, as well as a carrying bag for ease of trasportation and storage.